Fans of classic frontier survival stories, as well as readers of dystopian literature, will enjoy this futuristic story about an epic cross-country journey. In a Handful of Dust is set ten years after the first novel, Not a Drop to Drink, as a dangerous disease strikes the community where teenage Lucy lives. When her adoptive mother, Lynn, takes Lucy away from their home and friends in order to protect her, Lucy struggles to figure out what home means. During their journey west to find a new life, the two face nature’s challenges, including hunger, mountains, and deserts. New York Times bestselling author Michael Grant says Not a Drop to Drink is a debut “not to be missed,” and this companion title is full of Mindy McGinnis’s evocative, spare language matched with incredible drama and danger. 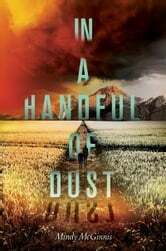 In a Handful of Dust is perfect for fans of the Partials, Enclave, and Legend series.